Star wars. Star wars. Star wars. Are your kids over-the-moon excited about the new Star Wars coming out? I love seeing the kids at the store oohing and ahhing when they pass by the isle with the Star Wars stuff…. oh, to be young again! My 2 year old isn’t quite old enough to get in on all the hype but she still absolutely loved our Star Wars themed day! She played with her light saber from morning till night, literally night — she chose it as her 1 toy she’s allowed to go to bed with. And I’m sure she would have slept in her Jedi outfit, if I would have let her. If you’re looking for a day of Star Wars fun with your kids (for the holidays, May 4th or just for fun), keep reading! AND don’t miss the awesome giveaway for a $100 Toys“R”Us gift card and Duracell batteries at the bottom of this post! Be creative and use what you have. 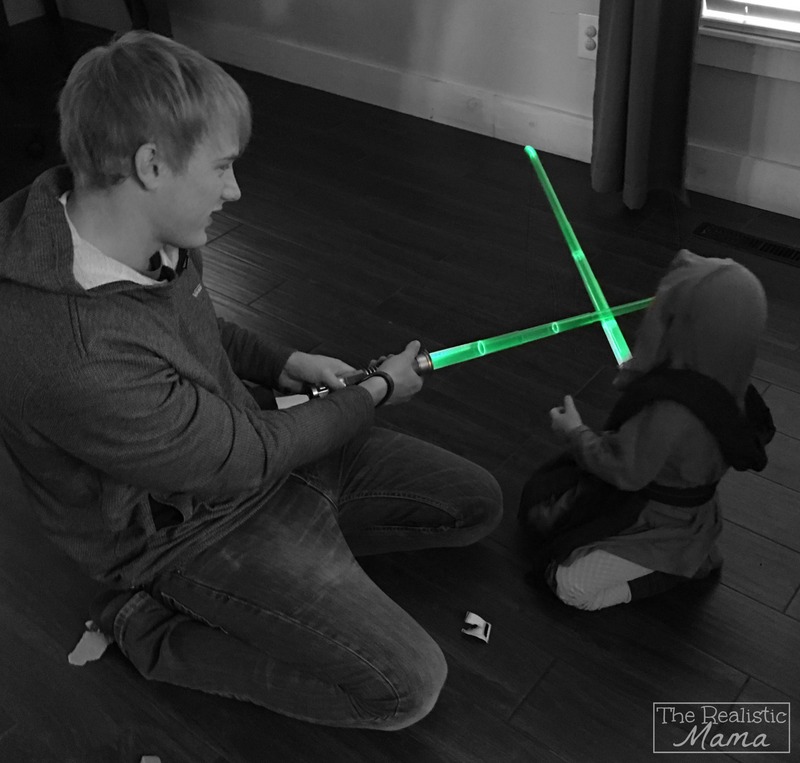 We were able to pull together a little Jedi outfit just from what we had in our closets! Oversized light brown long-sleeve shirt — I grabbed one from my closet for my 2 year old to wear. I was so excited to give my little Jedi her first light saber. She was SO excited to open the box and thought it was the coolest thing ever… but it didn’t light up or make any sounds yet… it still needed good ole’ batteries. There’s nothing worse than giving a kid a toy that requires batteries and having NONE in the house — meltdown, sadness and disappointment. Thankfully Duracell had us covered so we could avoid all of those! I put Corey in charge of putting in the Duracell batteries. Once girly realized they lit up, she didn’t want anything to do with the one that was still missing the batteries — she didn’t understand why dad could only “fix” one at a time! 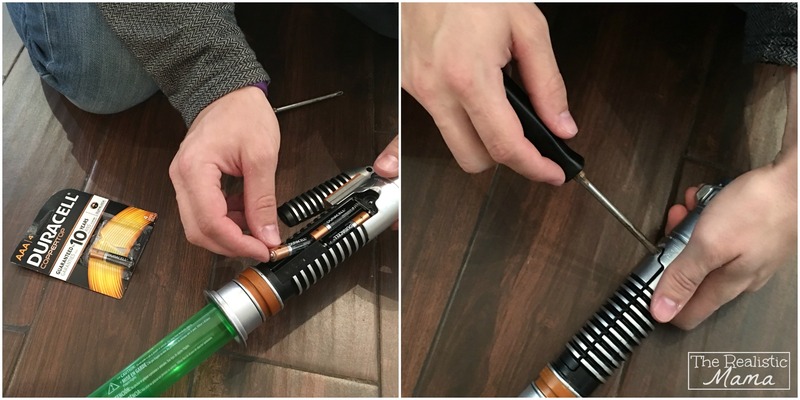 Once they were both ready, we turned off the big lights, turned on the light sabers and had way too much fun! I don’t know who had the most fun, dad or girly! 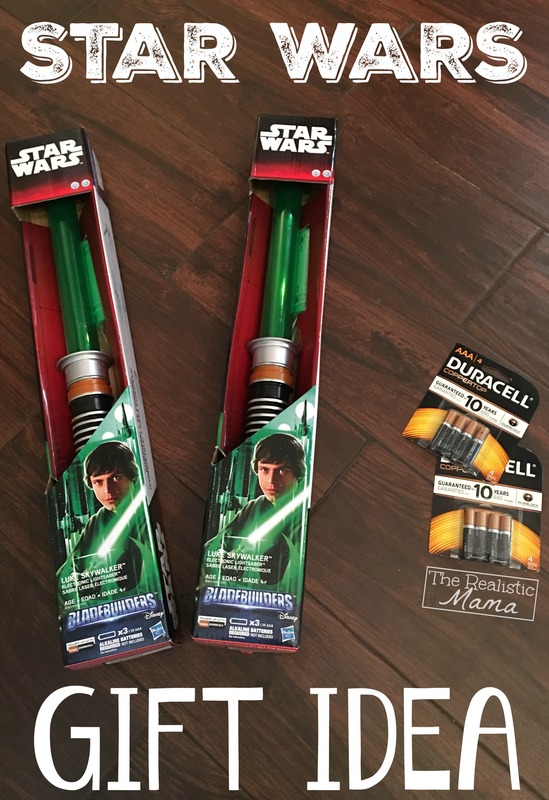 Light sabers and Durcell batteries can both be picked up at Toys“R”Us — they make the perfect holiday (or just for fun) gift for your Star War’s lovers! 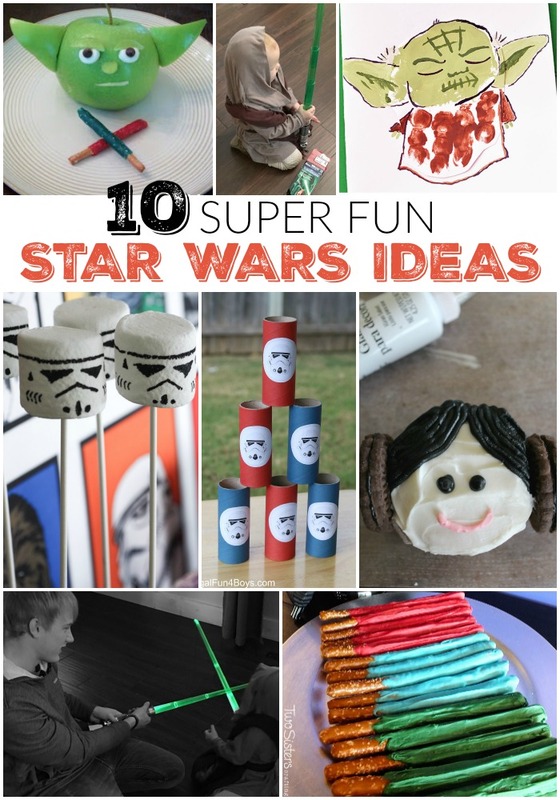 Next, you can pick a few activities and snacks from the list below to top off your Star Wars day of fun! 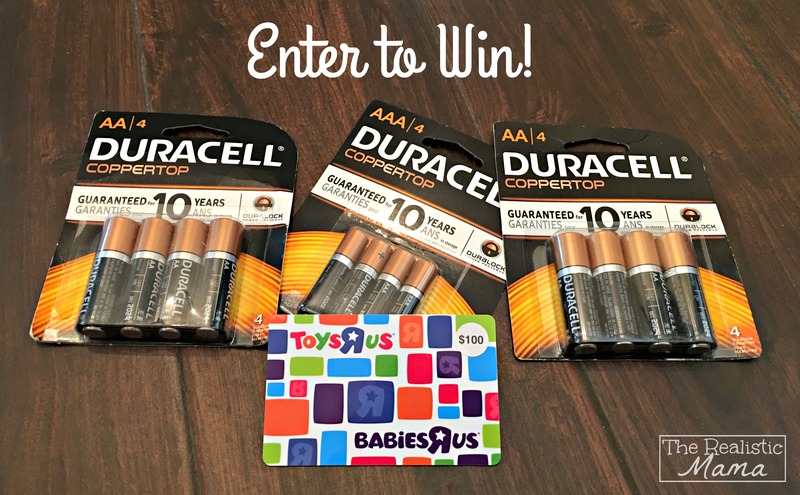 Speaking of the holidays, gift giving and awesome Star Wars stuff, be sure to enter to win a prize package with a $100 Toys“R”Us gift card and Duracell batteries — don’t get stuck without batteries during the holiday gift giving season! Must be 18 years or older to enter and a U.S. resident. $3 OFF — On November 22, look for a $3 OFF coupon when you buy any 2 packages of Duracell batteries (AA/AAA 16pk, D/C 4pk, 9V 2pk or larger, Quantum AA/AAA 6pk, D/C 3pk or larger). You’ll find this coupon in most Sunday newspapers. $1 OFF — On December 13, look for a $1 OFF coupon when you buy one package of Duracell Coppertop and Quantum. This coupon will be available in most Sunday newspapers. And while you’re at Toys“R”Us getting your batteries make it the one-stop-shop for all the toys on your holiday list, including Star Wars toys like the Luke Skywalker Light Saber! Thanks for stopping by! We’d love to see you again, connect with The Realistic Mama on Facebook, Pinterest, Instagram, and by subscribing to our free email newsletter! This is a sponsored conversation written by me on behalf of Duracell & Toys “R” Us. The opinions and text are all mine. I never forget the batteries! We keep an ample supply. Sometimes we don’t have enough batteries for remote controlled toys. My kids usually want to go out to the store that instant to buy them. My son had an Ironman toy that needed batteries and he was disappointed he could not play with it right away. so far, we have not forgotten yet. Oh I remember the first and only time I forget the batteries! I felt so bad since she would not play with her toy! Now…whenever I buy toys that need batteries, I buy them at the same time and tape them to the gift! It so hard when they cannot play with a toy they are so excited for! I have a large stash of batteries in my house so I always have if needed but I have given gifts a few times that needed batteries that I realized after I didn’t add and wrap with the gift. I have given gifts without batteries before but luckily the person who received the gift had batteries available. I felt bad but it all worked out. Haha! Oh the batteries! I always forget ? My son was so upset that he couldn’t play with his remote control truck last year! This year i am going to be prepared! !